while others were never really heard of. These stories come from the athletes’ personal stories, moments before their event, or from their social media posts. Here are some American athletes that received attention outside of their sports. 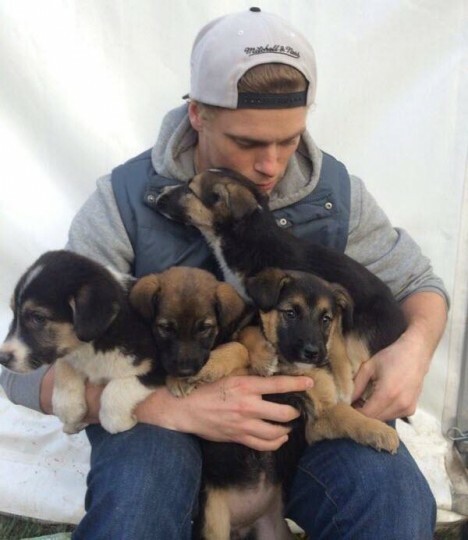 Slopestyle skiing silver medalist Gus Kenworthy captured hearts of animal lovers as he did whatever he can to adopt four puppies and their mother. He is keeping two of the puppies while his brothers get the other two. Kenworthy’s mom is keeping the mother. Lindsey Jacobellis did not medal at her event at Snowboard Cross, but left Sochi with her hands full. She also adopted a stray dog. The US Hockey team was a disappointment by failing to beat Canada and losing the bronze match. Some of the team members are working on adopting stray dogs around Sochi so they will not be going home empty handed after all. Shaun White was a medal favorite when coming to Sochi to become a three time Olympic champion but fell short earning fourth place. Little did people know that during his event, two kids were sent to Sochi to have their wishes granted to see White compete by Make-A-Wish Foundation. Meeting White was not part of the deal. 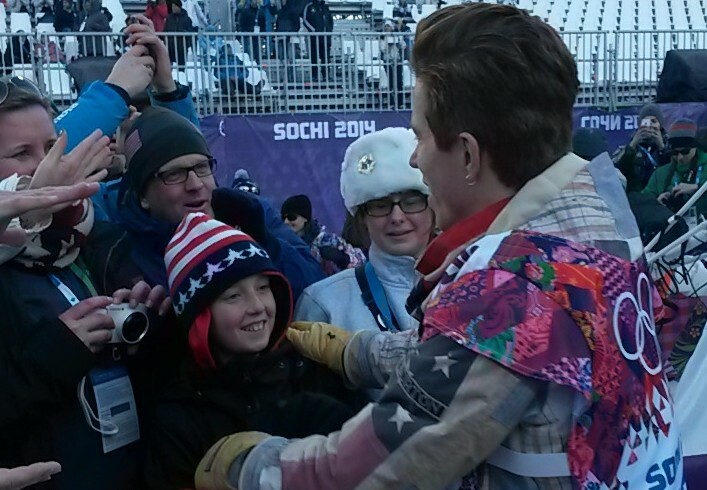 After finding out from a reporter and a snowboarding Public Relations person, White jumped over the fence to greet the cancer survivors and hug them. After the event, White gave his boards he used in the games to the cancer survivors. Before the 2006 games, Noelle Pikus-Pace broke her leg and was unable to compete. In 2010, she earned fourth place and decided to retire from the sport to start a family. After a miscarriage, her husband encouraged her to go back to Skeleton. She won the silver in her event where her whole family, including her young children who were there to support her. Johnny Miller made headlines after he posted on his Twitter account that he broke down his bathroom door after being locked in. He appeared in the media explaining how he did it and joking about it. Even though he did not receive a medal in bobsled, he will be remembered by this moment in a popular social media frenzy #SochiProblems. The former Green Bay Packer later was stuck in an elevator. Luger Kate Hanson, is known for her outgoing personality. She was seen dancing at Sochi and later revealed to be a huge Beyoncé fan. 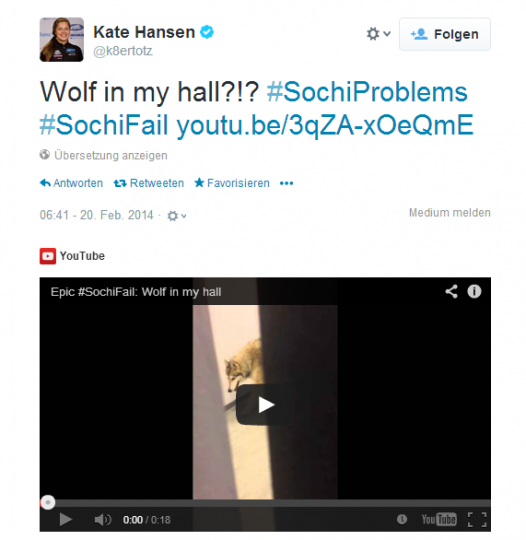 Henson made headlines again when she posted a video of a wolf spotted in the hallway in Sochi. Turns out it was a prank by talk show host Jimmy Kimmel. Kimmel filmed the scene in his studio and Hanson then posted it on her social media accounts. It caught media wide attention where news reporters were debating how it got in and what kind of wolf it was. 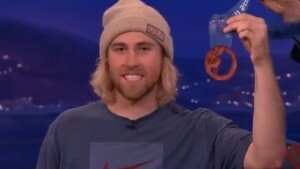 David Wise is the first person to capture gold in the new event in Halfpipe ski. He is a dedicated husband and father at a young age while being a pro skier. During his event, he kept a heart shaped rock that his wife found for him. A video of his daughter who was back in the U.S. was seen kissing the TV as her dad won gold. Maddie Bowman and other freestyle skiers dedicated their event to Sarah Burke. Burke a Canadian skier, died in a training accident in 2012, she was the pioneer making Freestyle skiing Halfpipe an Olympic event. Sage Kotsenburg did not only make history but he is known for his personality. He spoke in a way where Russian media had a difficult time translating him. He has a catchphrase “Spoice” which grew after his victory. He tweeted that he wished his medal was made out of bacon. During his appearance on Conan, he received a medal out of turkey bacon from a local Pennsylvania meat company.